I can think of no better role model for what it looks like in practice to be a disciple of Mary than that provided by the great Italian educator, Dr. Maria Montessori (1870—1952). Today she is known around the world as the author of a method of education for young children. But she insisted throughout her lifetime that she was not the author of a method of education, but rather that in 1907 she had discovered a way to “help children to live”. For her that meant liberating children from what she saw as abusive child-rearing practices dominated by now discredited ideas such as “children should be seen and not heard” and “spare the rod, spoil the child”. She called on all adults to stop silencing and punishing children for being children and instead to create home and learning environments that catered to the unique spiritual and psychological needs of childhood. 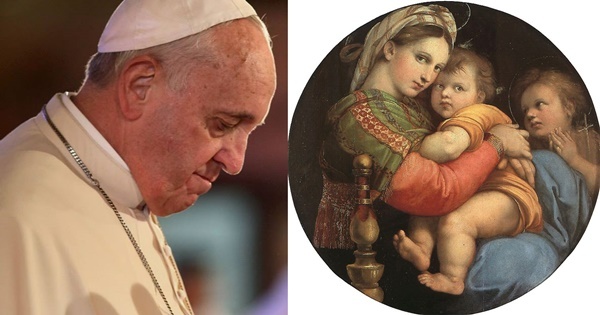 As a pointed reminder that to succeed in this we must imitate Mary, Montessori wanted the image of Madonna and child by Rafael (known in Italian as Madonna della Seggiola, “Madonna in chair”) to adorn all Montessori classrooms. Many of us raised in the Catholic faith have devoted some imaginative space to pondering what type of mother Mary was. I, for one, cannot imagine her silencing her Son. Scripture recalls that she was upset not that boy Jesus was teaching in the Temple, but that she did not know where he was. And it is even harder to imagine her inflicting physical harm on Jesus no matter his transgression. The boy who grew up to be a man who gave his life to demonstrate the centrality of mercy and love to his heavenly Father, must have been schooled in those virtues by his earthly parents as well. Such a failure on the part of the Church is all the more tragic given the Church’s embrace of Dr. Montessori’s reforms a century ago. In 1910, Pope Pius X, who promoted communion for children, encouraged Dr. Montessori to create materials to help the child understand the mystery of the Mass. By 1910 she had developed such a curriculum, known as the Atrium. And before his death in 1922, Pope Benedict XV was so impressed by his conversation and correspondence with Dr. Montessori that he had her books placed in the Vatican library. Pope Francis has called the entire church to repent of the hunger for power and privilege that led so many to despise the little ones and sacrifice them to their fears. As we strive to answer that call, we would be well served by recovering the tremendous resource provided by Dr. Montessori. Her work allows us to see that the ongoing clerical abuse of children is the result of the failure of men to practice universal motherhood. Before God became flesh, a mother was chosen. Which is why the church has always understood that motherhood is a sacred calling, a divine responsibility if God is to have any chance of being present in the human experience. A practical way for the Church to leave behind the culture of death that has so enthralled it would be to require Montessori to be taught in seminaries. In fact, all clergy, present and future, should be required to read Maria Montessori’s original writings, especially The Secret of Childhood and her gem, The Child in the Church. Clergy should be trained in the Catechesis of the Good Shepherd and become adept at “following the child”, the essential practice for all Montessori educators. Dr. Montessori believed to be a follower of Christ one must be free of shame at being a follower. That shame, manifested as a thirst for power and privilege, is the sin that causes us all to stumble. Children are unabashed followers, openly imitating adult models. To follow children is to learn from them how to be joyful followers, like the ninety-nine sheep who wait patiently in the sheepfold for the return of the Shepherd. When we wander off, the Good Shepherd will come to find us. Perhaps he searches for each lost child because he learned well from Mary how to be a very good mother. Images: Pope Francis, Wikimedia, Public Domain. Raphael’s Madonna della Seggiola, Wikimedia, Public Domain. Mrs Ross, i appreciate and share so Much your comment on Maria Montessori !? It’s a joy in my heart as i think she has identified the knots , the beginning and the end of our human misery…where to start with, …what to start with : the little child in us first, and around us…yes,, to promote universal maternity, whoever we are ! Thank you again ! It’s so important to me ! Hope to share more on this with you !